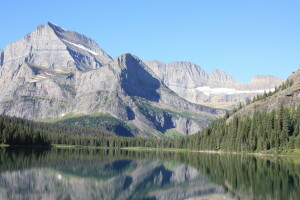 Having spent a wonderful time in the mountains of Glacier National Park and then plunging straight into back to school has given me little chance to go online or interact via social media. In fact while we were in Glacier there was, for over a week, literally no service. No cell phone. No internet. Nada. And you know what – after the initial frustrations (for instance no blog post two weeks ago from me!) – it felt amazing. My boys didn’t ask for iPad time (in fact we had deliberately told them no electronics), my husband wasn’t checking his work email slavishly, and I wasn’t feeling compelled to engage in any kind of social media activity. It was liberating! There was just us, nature and a few good books. What else could you ask for in a holiday? I used the opportunity to think about my latest WIP and jot down notes (longhand) in the small notebook I brought. I introduced my 10 year old twins to the joys of Agatha Christie (Murder on the Orient Express). We hiked, chatted, played UNO and made S’mores…And none of us really missed being electronically ‘connected’ to the world. Yet, it was surprising how quickly upon our return we soon fell back into our old ways. Emails. Texts. Facebook notifications. News alerts and more. Suddenly we were surrounded by the ‘noise’ of our usual highly connected lives. For me, at least, it was disquieting how quickly that noise became background once more, and I lost that sense of focus and stillness that I’d felt while being ‘off the grid’. So the challenge for me now, after the ‘back to school’ dust has settled, is to try and reclaim this inner rather than outer focus – but I’m not really sure how. I guess I could artificially induce disconnectedness by switching off the wifi or I could just rely on willpower not to check anything online while I’m working on my computer (a difficult proposition as anyone facing the blank page will know – oh how, easy it is just to procrastinate with a quick check of ‘news’ on the internet! )…but it feels like it’s hard to escape the constant barrage of ‘pings’ and ‘rings’ as every device I own signals for my attention. Do you find, like me, that being disconnected from the electronic world can be a liberating experience or is it too hard to pull away? How (if at all) do you try and ‘switch off’ the noise? Do you deliberately takes steps to try and disconnect? Or can you (unlike me) keep your focus despite the ‘noise’ around you? This entry was posted in #amwriting, Writing and tagged Clare Langley-Hawthorne, writing life by Clare Langley-Hawthorne. Bookmark the permalink. It’s absolutely liberating. We had a similar experience a few years ago on an Alaskan cruise. (Didn’t want to pay international roaming charges and the ship’s internet was expensive.) Only checked my email when we were in port. While we were at sea, we spent time playing dominoes and card games and talking with our friends one-on-one. I think everyone needs a social media/internet/electronic communication break now and then. Agreed! I just wish I could recreate it at home! I disconnect when I sleep, Clare. Otherwise I’m hooked in. I’m afraid that if there was a way to electronically tap into my neurological hard-wiring (there’s a joke about that which I can’t share here) I’d be first in line so long as the procedure didn’t involve a needle. That said…I can keep focus if I can or must, even if that focus, alas, involves a task which in turn is electronically or technologically dependent. It’s an excellent question, one that bears repeating as our electronic and real worlds merge and blur and become indistinguishable. I wonder what will happen when Virtual Reality systems become as common as smart phones. I go to the beach (6 hours away) where the house we rent has no Internet. There, I’ll go to an Internet cafe for breakfast (after having written for a couple of hours) and check my emails, and then the rest of the day is free of Internet distractions. It’s wonderful, and wonderfully productive. I’ll sometimes (like for the past two weeks) refuse to check Facebook, but it’s a real challenge to avoid my emails. I do NOT have a smartphone. I figure I’m at home most of the time, so I really don’t need one. If I were still working outside the home, I’d probably have one. I’ve had to tell guests (usually Americans visiting Mexico, where I live), nicely, to disconnect over a special dinner because I think it’s rude not to totally connect with the people sharing a meal with you. Old fashioned? Probably, but if I invite people over to dinner, I want to connect with them. As for focusing on my writing, I set deadlines and goals, personal ones–always have with any type of project–and that helps. I hate to say this, but I will: I’m selfish about my writing time, and get a whole lot more done when I’m not in a relationship. I admire those who can manage a family, and still get their writing done. Bravo to you! I have a room to write in that is not connected to the office. No phone. I did run a hard wire internet connection to that room, but I connect only when I need to look up something. I keep the wireless connection turned off. I also need peace and quiet and separation from the noisy electronic world to work efficiently. Someday, it would be nice to have a cabin in the woods to truly escape. I need to have a disconnected room – that’s a good idea as a retreat. A cabin in the mountains would be nice! I head up into the Seven Devils mountains to camp and run. Usually, it takes just a couple of hours to have my brain reset. A bigger test will be a six week Kenyan trip I started at the beginning of next year. I’ll be taking lots of notebooks and an iPad for writing and ebooks, but there won’t be any internet and I’m leaving the music behind. Wow – the Kenyan trip sounds awesome! Sounds like a fantastic and refreshing trip, Clare. I really have to work hard to find disconnect time. I always try to take Sunday off from writing and business concerns. I can feel my brain resisting, wanting to type something, wanting to check some stats, plan some marketing. One thing I do is try to catch up on my reading on that day. (This gets tougher during football season). Sometimes my wife and I drive to the beach (20 minutes away) for a bite to eat, get a table by a window looking out at the sea…surrounded by other patrons looking at their cell phones…and then I find myself reaching…reaching for my own phone…my arm becomes like Dr. Strangelove’s at the end of the movie, operating completely on its own. Finding quiet time is actually and ironically something I have to work at. But it’s worth it. If I’m able to resist working on Sunday, then I don’t feel like Fats Domino on Monday. I think belong connected is almost like a compulsion – one which is hard to resist. I need to mimic the ‘disconnectedness’ I had but it’s hard as my brain knows if I’m just faking it! I just spent four days in the hospital for a heart procedure. I was totally disconnected from the outside world. No cell phone, no kindle, no internet, not even a clock in the room. At first it drove me nuts. Then after the first day, it was oddly rejuvenating. Almost regretted coming home. Almost. If only I had a notebook and pen with me. Funny how at first you feel really frustrated and then…you really don’t miss it! It is liberating to be off the grid. I have to take deliberate steps to disconnect because I feel guilty if I don’t do something. I was off social media for the last four days and after the first day, I didn’t miss it at all. Now that a new work week has started and I have to do the usual blogging, the guilt has returned. I have to check Twitter. I have to post updates. It takes effort to remember that, no, I DON’T have to. Thanks for your report. Glacier National Park is glorious! The guilt…totally get it…you feel like you ‘have to’ do social media and blogs and online stuff especially as, in our profession, it’s expected. That’s what makes enforced disconnection so nice – it’s guilt free! I envy you that trip, Clare. I try to disconnect at night when I go for long walks along the water here in Florida. They really help me concentrate and work out problems in my writing. Damn social media. I find that even when disconnected, I think about it. Not longingly, but like someone who is behind — gotta contact Mike… wonder if I heard back from Sue… Kill Zone deadline is tonight… did Jack get me text?… and so on. In addition to a quiet get-away, I think maybe a shrink is in order. So happy you had a wonderful time at Glacier. Apparently the smoke from the fires didn’t bother you. I live just south of Glacier and love to camp up there at the beginning and end of the season. I know what you mean about no cell or internet service. It’s really quite a relief. Hope you saw lots of animals and trees and got your batteries recharged.